I have been a bad blogger! I've had some annoying health issues resurface lately, so I've been really lazy. As if to prove my point, the pictures in this post are indefensibly horrible. I hope you can look past the awful lighting and out of focusness (there has to be a better phrase/word for that) to get the gist of my projects. Despite the name, Wonder Under is not manufactured by KY (sorry, I couldn't help myself) but by Pellon. It is the most common name brand fusible webbing that binds two fabrics together with heat. I use it in my purses and always have tons of it around. 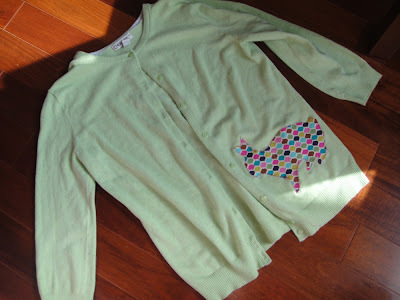 One day, I decided to play with some cardigans I have. I have 3 nearly identical cardigans, each in a different color. I rarely wear them because they are kind of plain. I prefer bright colors and patterns, so I thought I'd jazz them up. 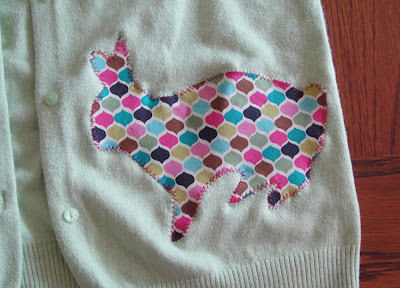 I have a pink and a blue cardigan to play with and I can't wait to see how those turn out. The whole project literally took under an hour to make. It was so easy that I decided to so something similar for my brother for his birthday. My brother loves the movie "The Big Lebowski." 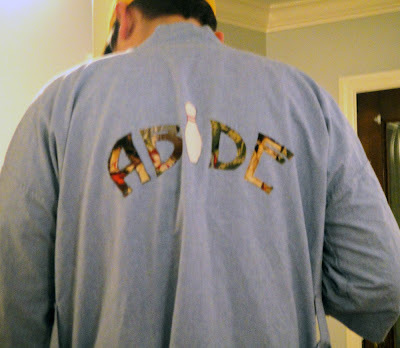 Going off of an idea my friend Lindsey had (read: "plagarized"), I made him a robe with the word, "abide" on the back. I bought a chambray robe off of Amazon. 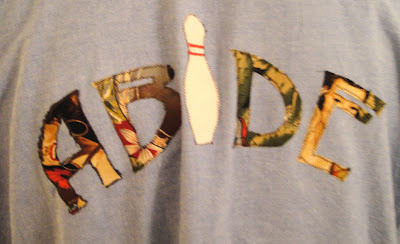 I wrote the word in a font I liked and followed the same process I did for my sweater. I was a little nervous about what sort of fabric to use for "The Big Lebowski." I reached in my scraps and the first one I pulled out was perfect: Alexander Henry's Las Senioritas fabric. It features Mexican pinups and had the pulpy feel I was looking for. I love it when things work out randomly! Since the letters were not big, only parts of the fabric show, like a pair of lips or eyes . . . which I love! Bless you for making a ky joke. Anyway, I was very skeptical when you introduced the sweater idea, but I love the way it turned out!